The perfect combination of luxury all-inclusive hospitality, world-class service and stunning surroundings. 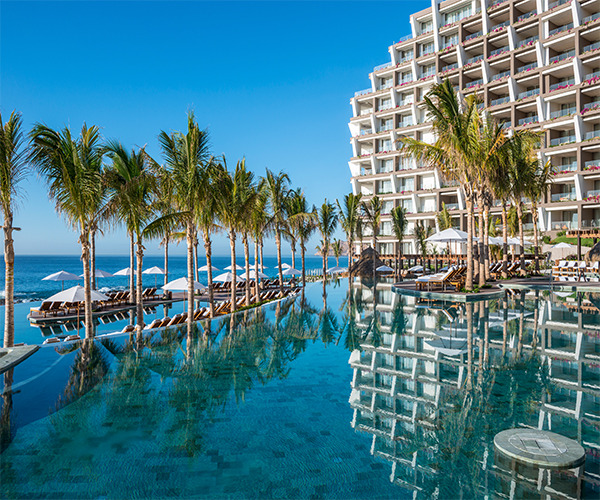 Set in one of the most sophisticated destinations in Mexico, Grand Velas Los Cabos opens its doors right where the Sea of Cortez and the Pacific Ocean converge. The astonishing beauty of the contrast resulting from the union of the desert and the sea is unsurpassed. Over 307 luxurious suites measuring over 1,180 sq. ft. with private terraces, personal plunge pools, spectacular views and excellent service, make staying at this resort an unforgettable vacation experience. This luxury AAA Five Diamond resort is located between Cabo San Lucas and San Jose del Cabo. It offers the next generation of all-inclusive amenities and facilities, with dramatic ocean views and unique spaces throughout the resort. Grand Velas Los Cabos features a wide variety of gourmet restaurants, coffee shop, mezcal and tequila tasting room, wine-based features inspired by the proximity of Mexico’s wine region, Convention Center, Spa with hydrotherapy facilities, oceanview Fitness Center with personal trainers and exercise programs, and three oceanfront pools. Families will enjoy recreational activities, as well as a modern Teens’ Club and Kids’ Club with arts, crafts, games and more. The Personal Concierge service is available 24/7, and the resort’s Convention Center features 16,370 sq. ft. of flexible event space. Carretera Transpeninsular Km. 17, San José del Cabo, Corredor Turístico, Municipio de Los Cabos, Cabo San Lucas, C.P. 23405, Baja California Sur. With a privileged location in the luxury corridor, just 20 minutes from downtown Cabo San Lucas and 35 minutes from the San Jose del Cabo International Airport, this beach resort offers an authentic escape where the Sea of Cortez merges with the Mexican Pacific. The surrounding pristine waters, impressive sunsets and untouched landscape frames the luxury, relaxation and sense of wellbeing only available at Grand Velas Los Cabos. Your journey to renewal begins in the luxurious SE Spa, where experienced and caring therapists combine the powers of water, light, sand, sun and sea in holistic treatments designed to restore your body, mind and spirit. For example, the Spa’s unique seven-step water journey is a multi-sensory experience that includes an ice room, clay room and experience pool. Additionally, you can enjoy the Jacuzzi, sauna, steam room and polar pool or choose from a vast array of healing massage services, including the Spa’s signature Blue Agave Vella Massage, restorative facials, and pampering body treatments. The Path to Introspection and Renewal of Your Being. Embrace an authentic re-interpretation of luxury and wellbeing, based on ancient rituals and ceremonies at the Grand Velas Signature Spa. With 16 Spa suites including one Wedding Suite and four double suites, water ceremonies, Beauty Salon, Barber Care Studio and Spa boutique, our resort invites you to recharge your spirit surrounded by the breath-taking beauty of the Baja Peninsula. Hours: 8:00 a.m. - 8:00 p.m. Unique in its concept, our Spa Atelier offers a variety of workshops to help expand your awareness and knowledge of the world of wellness. Interesting courses in skin care, nutrition and aromatherapy, preparation of fruit waters, tea rituals, mandala-making and workshops for women, couples and children promise to enhance vacation experiences and provide a deeper dimension of wellbeing. WATER CEREMONY: A meeting of clarity and rebirth through water. MEXICAN CEREMONIES: A fusion of flavors, aromas and the refreshing touch of our healers. MASSAGES: A meeting of clarity and rebirththrough water. GRAND VELAS CEREMONIES FACIALS: Ceremony of Light. BODY TREATMENTS: Ceremony of Sand, Sun and Sea. YAAKUNAH CEREMONIES: Ceremonies of love. FITNESS CENTER- Hours: 6:00 a.m. – 9:00 p.m.
Every guest at the Spa at Grand Velas Los Cabos stays in the height of luxury in a spacious and beautifully appointed suite. Grand Class Suites feature personal plunge pools – and the ultimate privacy. Indulgence comes naturally in the stunning Wellness Suites, with spa concierge service and organic amenities. The resort offers seven gourmet restaurants including two all-day restaurants, and five fine dining à la carte restaurants; plus a coffee shop. Restaurant openings may vary according to season. 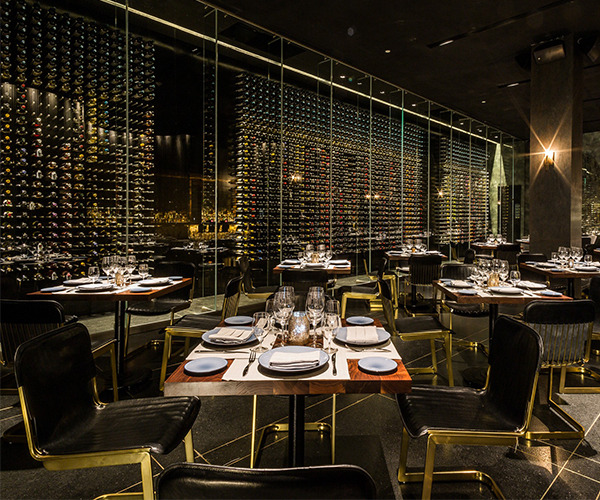 The resort also offers top-shelf domestic and international spirits at all restaurants. Breakfast - 7:00 a.m. to 12:00 p.m. Lunch - 12:00 p.m. to 5:00 p.m.
Daytime - 11:00 a.m. to 6:00 p.m. Lunch 12:00 p.m. to 6:00 p.m.
Dinner 6:00 p.m. to 11:00 p.m.
Dinner - 6:00 p.m. to 11:00 p.m.